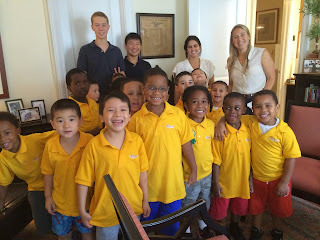 Accompanied by their teachers and their Saint David's alum counselors, Horizons' rising first grade class came to visit my office this morning to express their gratitude for a great summer. They were so excited. It's been a busy summer at Horizons. A highlight in the rising second and third grade program has been the strong STEAM push. In second grade the students studied insects. They read about and researched different types. Using what they had learned about the anatomy of insects, the boys then created their own in art class. Rising second grade boys also learned computer programming skills, programming Bee Bot robots to navigate a grid. In the third grade, the STEAM theme was space. Rising third grade boys studied the characteristics of different planets and used this knowledge to paint murals of the solar system in art class. During their STEAM class, the boys designed and constructed rockets with an eye to maximizing speed, distance, and accuracy. To launch their rockets, the boys built stomp launchers using a soda bottle, portions of the inner tube of a bicycle tire, and a length of PVC pipe. Boys learned how to create sufficient force to launch their rockets by quickly moving air from a large volume to a smaller volume. Some boys enjoyed instant success with their rockets, while others needed to make multiple design changes. Another highlight of the summer included several trips to Marymount’s science and drama programs, including the opportunity to visit Marymount’s robotics lab, the “Fab Lab.” Here, the boys built Lego robots of soccer goalies and strikers, then programmed them using advanced software. By the end of their visit, the boys were playing tabletop games of soccer with their robotics creations. Horizons at Saint David's brings boys from low-income families in Harlem to Saint David's for a six-week academic focused program--a commitment to the greater common good informed by the school's mission.